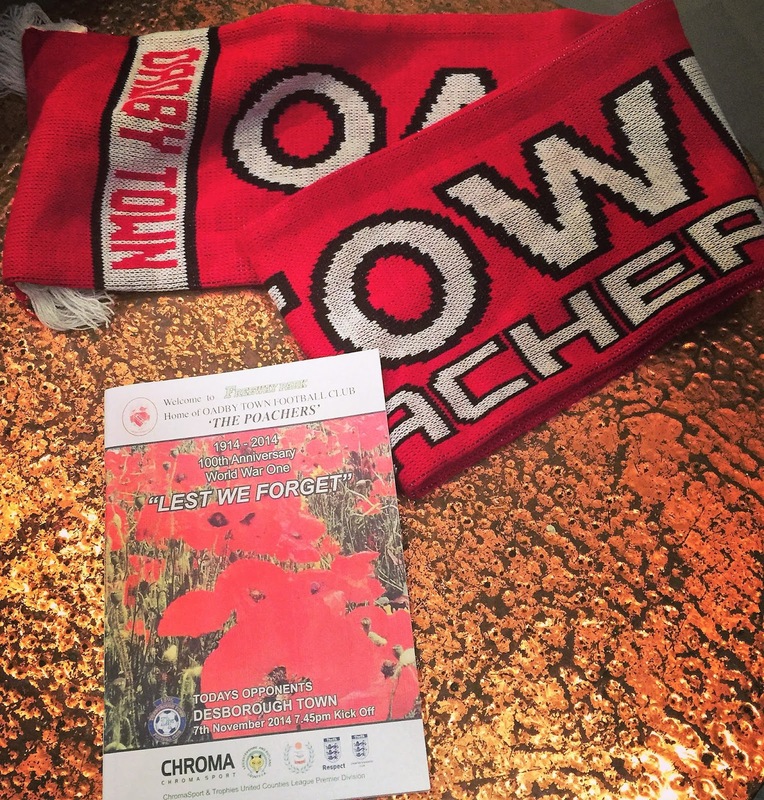 Oadby Town were formed in 1937 under the name of Oadby Imperial. 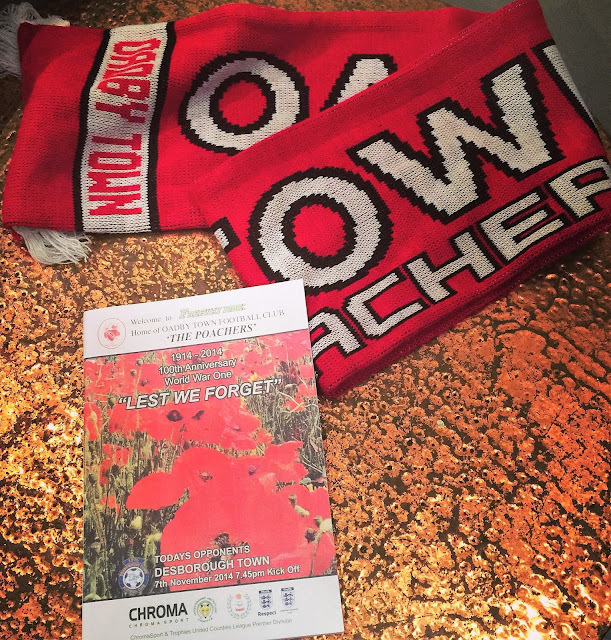 They joined the Leicestershire League in 1949 and spent many years there before joining the Midland Alliance in 1999 after being Champions for the 4th time in succession. They carried that on in their first season, winning the league at the first attempt. They continued to do well, but fortunes soon declined and in 2010 after finishing 22nd out of 23 teams. For the next season, they transferred to the East Midland Counties league, finishing 3rd. 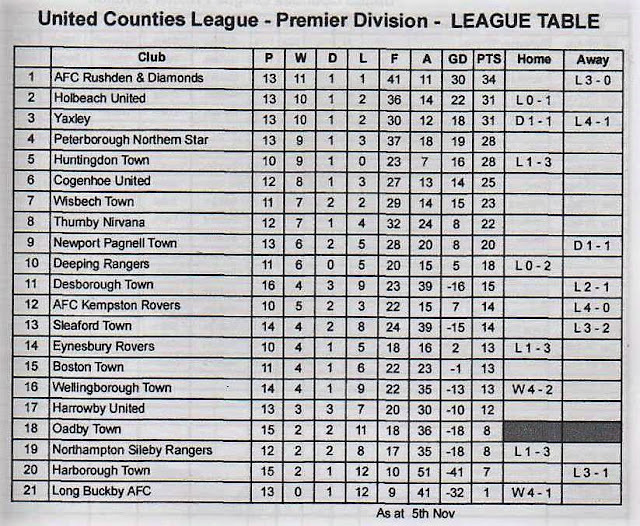 Once again they were on the move though, going over to the United Counties League Division 1. 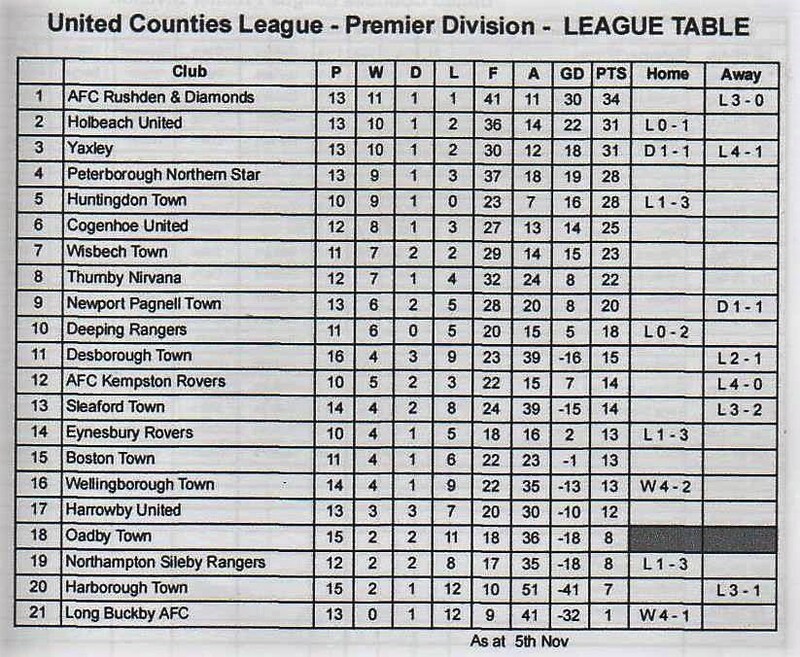 A 4th placed finish in their first season was followed up with the Championship last season, winning them promotion to the United Counties Premier. They were finding going tough at their new level but were keeping their heads above water in 18th place. The clubs best season in the FA Cup came in their debut season of 1999/00. They beat Bilston, Willenhall and Halesowen before losing out to Eastwood Town in the 3rd Qualifying Round. 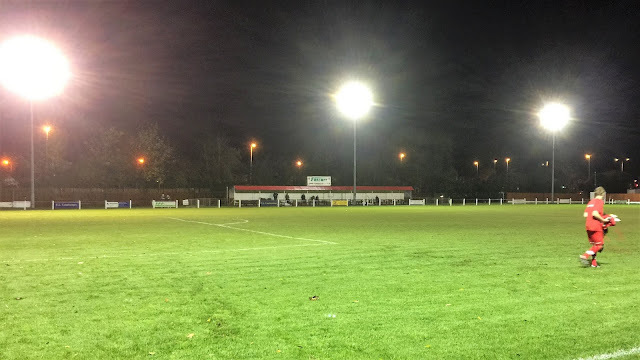 They have had several good runs in the FA Vase, the best of which saw them reach the semi-final in 2002/03 before going out to Brigg Town of the Northern Counties East league. Various local cups have been won, most recently the wonderfully named Battle of Britain Charity Cup in 2012/13. Regular readers of this blog will know that I am a fan of Friday night football. I find there is no better way to wind down after a week at work than a football game. Usually, I'd have to head over to Wales, but on this occasion, I was hoping to get tickets for Warrington v Exeter in the FA Cup. Annoyingly they were not sending out tickets, and in any case, they sold out within a few hours. So I started looking for more games. 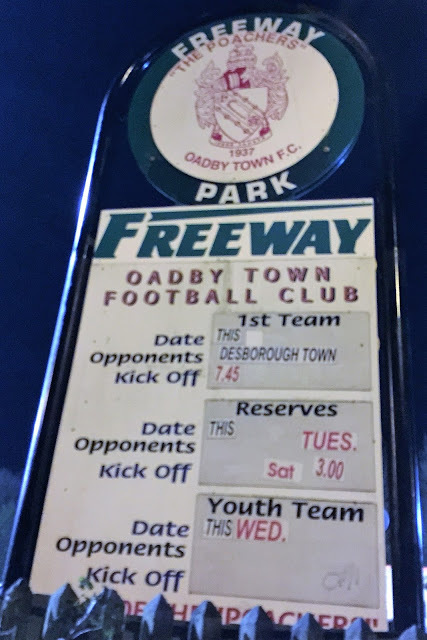 I was in luck, in the East Midlands, near Leicester, there was a game between Oadby Town & Desborough Town in the United Counties League. Even better, Anwar would be able to come with me, thus giving me some much-needed company and helping out with fuel costs.On the day of the game, I had a surprisingly easy day at work, finishing at 12. Usually, it's a busy old day with me struggling to get out before 2, but not today. I did have some disappointment though before. The guys at Groundhop UK had organised a great groundhop in 4 countries later this month. Initial interest was slack, and I thought it was dead in the water. However last night I got an email saying they could take a minibus, but sadly it was too short notice to get the weekend off work, as others had already booked it off. So my European adventures will have to stay at Atletico Madrid and Lazio for now. I was glad of the extra time after going home early, as I had a few things to do, including posting a phone. As the day was miserable and wet, I tweeted Oadby Town to inquire about the state of the pitch. Their groundsman had confirmed that it was OK, so it was all systems go. I left at 3.30, picking up Anwar at 4. As usual, it was a poor journey - slow getting out of Aylesbury, slow through Milton Keynes and stop-start for most of the M1. We eventually got to Oadby at 6.45 after an hours delay. We parked in the road that we thought the ground was in, but the car park appeared locked. It turned out that they had another up the other end, which we discovered when walking into town. I tapped in the local Wetherspoons on my phone to see if it was possible to salvage a meal from the day, but with it being a mile away and time running out, we settled for walking and finding a takeaway. That we did, and 'Best Kebab' served it's purpose well, dishing up a huge burger with donner meat, chips and drink for £4, which was a great deal and very tasty. I walked back, getting into the ground around 7.20. I paid £5 for entry, plus another £1 for a programme. First port of call was the club shop, where I picked up last season's scarf for £5. They had a nice selection of stuff including old programmes, but sadly nothing that I needed. I then went into the bar and got myself a pint of Thatchers Gold for £3.10. I drank that whilst walking around the ground getting pictures. After I had finished that, I met up with 2 groundhoppers that I knew, Jack and John, as well as a couple of hoppers from Leicester called Alan & Ken. We settled down to watch the game together, sitting in the main stand and it turned out to be a cracker. 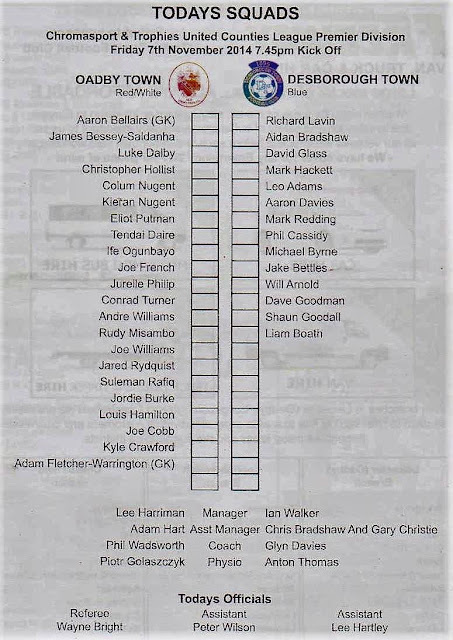 I spotted 2 Wycombe connections in the programme. Firstly the current Oadby manager also managed Coalville when they had their famous FA Cup run before losing to us. And former reserve Joe Cobb was also in the squad for the home team. Oadby scored after 2 mins after a wayward pass from Adams then after 6 mins another error in defence put the two up with both sides defending badly and it continued throughout the game Redding pulled one back for Desborough after 17 mins then Byrne equalised just a minute later. Oadby scored again after 34mins. The visitors started the second half brightly and equalised again through Byrne after 50 mins but then gave away a stupid penalty after 52mins which the Oadby player missed it could have gone either way after that but Desborough won it when in the 82min Bettles fired home from 12yards to win it a good response from going 2 down. 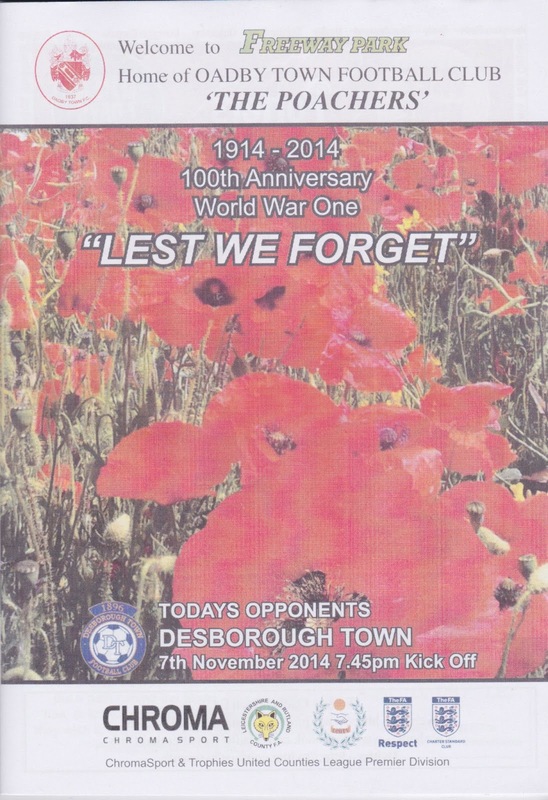 (Report from Desborough Town Website). It was a fairly quick getaway and a reasonable journey home, despite 15 miles of needless roadworks and 50MPH average speed cameras on the M1. I dropped Anwar off in Aylesbury at 11.20, before getting home myself at 11.45. I watched a bit of TV and checked on the internet before getting to sleep at the reasonably early time of 1am. FREEWAY PARK is your average step 5 ground, with just the once covered stand. It comprises of benches mainly and holds around 200. The rest of the ground is open to the elements. One surprising thing is the club shop, which is one of the best I have seen at step 5 with a good range of merchandise and old programmes too. The bar was also nice with club stuff on the walls and a decent range of drinks. I didn't try the tea bar, so can't comment on this. The towns of Wigston & Oadby are both within walking distance and offer various pubs and takeaways. I enjoyed my visit to Oadby Town, a good friendly club and a great game.